When I saw this in the aisles a few weeks ago, I literally stopped in my tracks. Yes, the bright pink packaging caught my attention. But then I looked more closely, and realized that this Get Gorgeous tea is a must-try. 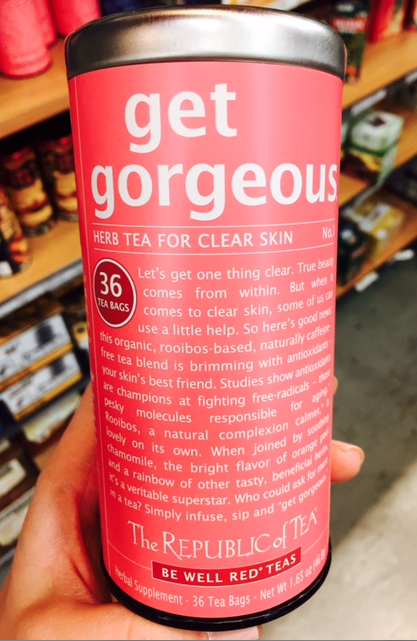 I do love tea, and anything beauty-related is my world, so this is the perfect combination. The contents in this pretty little tin promise to clear skin, make it more radiant, help with anti-aging, and to beautify from the inside out. This herbal Rooibus tea from The Republic Of Tea is packed with antioxidants, which fight free-radicals. And the orange-berry-pomegranate-chamomile flavor sounds yummy, as well. Let me know if you like it! Today I’ll Be A Mermaid. How About You? Where did you find this?! It sounds like something I MUST try! You can also get it at Cost Plus World Market. Curios to hear how you like it!